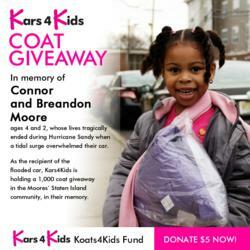 The tragic death of Connor and Breandon Moore in Hurricane Sandy is memorialized by the Kars4Kids, Koats4Kids fund. In the days following the harshest storm to hit the Eastern Coast in decades, Kars4Kids, a car donation charity based in New Jersey, received record numbers of flooded and storm-damaged vehicle donations. But the donation of one SUV, a 2003 Ford Explorer, from the New York Police Department, stood out. It was this very SUV that stalled as 39-year-old driver Glenda Moore tried desperately to escape the rising floodwaters in Staten Island. It was from this SUV that the mother of Breandon, 2, and Connor, 4, fled, only to have her two little boys swept out of her arms by a powerful wave of water. The boys were found dead days later in a marshy dead end street, not far from each other. Saddened and inspired by the story, Kars4Kids could not just accept this donation like any other. The charity quickly established the Breandon and Connor Moore Koats4Kids Fund from the proceeds of the donated SUV. Donations to the fund will be used for a coat giveaway on Staten Island in December. Praised by President Obama for the way he stood by the Moores in the days after the storm, NYPD Lt. Kevin Gallagher was the one who made the donation to Kars4Kids. When President Obama visited Staten Island to survey the damage caused by Sandy he said "That's not in the job description of Lieutenant Gallagher. He did that because that's what so many of our first responders do. They go above and beyond the call of duty to respond to people in need. And so I want to give a shout-out to Lieutenant Gallagher, but I also want to point out, the Moores, even in their grief, asked me to mention Lieutenant Gallagher, and that says something about them as well." The public is being asked to help with a donation of $5 to cover the costs of the coat distribution. All the money donated will be earmarked for the Moore fund. Kars4Kids expects to give out close to a thousand coats at the event. Date time and location the event have yet to be announced. Details can be found on the Kars4Kids Koats4Kids page.